$5,000 is a healthy budget, but it doesn't go as far as you'd hope, especially when choosing a Round cut (which are more expensive than similar Shapes.) As such, we are going to focus on getting the best diamond available at 0.99 Carat or above, to maximize value. Clarity will be set as VVS1-VVS2. Once again, if you had to maximize size, then a VS1-VS2 would give a bit more to play with, but right now we're trying to maximize things across the board. Color will be set at a maximum of J. Given this price range, Carat and Clarity you'll be hard-pressed to find something I or above. With those settings in, we have 24 diamonds to choose from, so instead of trimming the pool by eliminating VVS2, which would bring us down to 12, we are going to sort by Carat size and pick the 4 biggest to choose from. We'll start by focussing at Depth %. For a Round diamond we want something with a Depth % of 59%-62%, give or take. Both Round-01 & Round-02 far slightly outside of that range, on the high and low side respectively. We'll keep an eye on those going forward. Next, we'll look at Table %, which should be from 53%-58%. This eliminates Round-02, as it has a Table % of 62%, which will make it look larger but dilute its brilliance. Round-01 has a VVS2 Clarity, compared to the VVS1 Clarity of the remaining other two. So, we'll knock that one off the list next. Of the remaining two, Round-03 & Round-04, Girdle size is slightly better for Round-03, but a minuscule amount. Fluorescence is negligible for both and the remaining factors are essentially equal. To make our choice then we are going to look at the Certification Company that examined the diamond. Round-03 is from IGI, while Round-04 is from GIA. Our preference being GIA, we will choose Round-04. 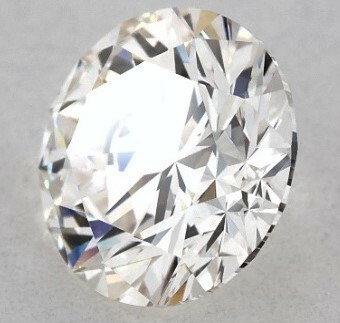 So what is the best Round Diamond for under $5,000? Our choice would be the 4th entry. At 1.04 Carat it is slightly larger than what we were shooting for and comes out less than $100 under our $5,000 threshold. We've matched it with a deep white gold Halo and Shank setting for the magnificent engagement ring you see here. Would you like us to help you with your diamond ring search? Contact us and we will provide you with a one-on-one service that will get you the best diamond available!